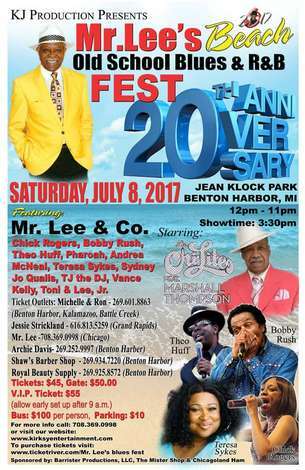 Mr. Lee's Beach Fest is back again in 2012 showcasing some of the best Soul, R&B & Blues acts around. Starring...Southern Soul Superstar T.K. Soul, and featuring Mr. Lee & Company, Nellie "Tiger" Travis, J John, Sydney Jo Qualls, High Performance, Sheryl Youngbood and Say Yes, Lee Jr., Joe Barr, Rico "Michael Jackson", Jeannie Holliday. portable chairs (no seating will be provided), grill, cooler, tent etc. *no alcohol allowed on the beach. Saturday July 14, 2012 @ Jean Klock Park, Benton Harbor, MI.